Jack Evans emphasized the need for a significant increase in funding to avoid potentially draconian cuts next summer, and he attacked Maryland and Virginia for not backing D.C.'s long-term funding ideas. 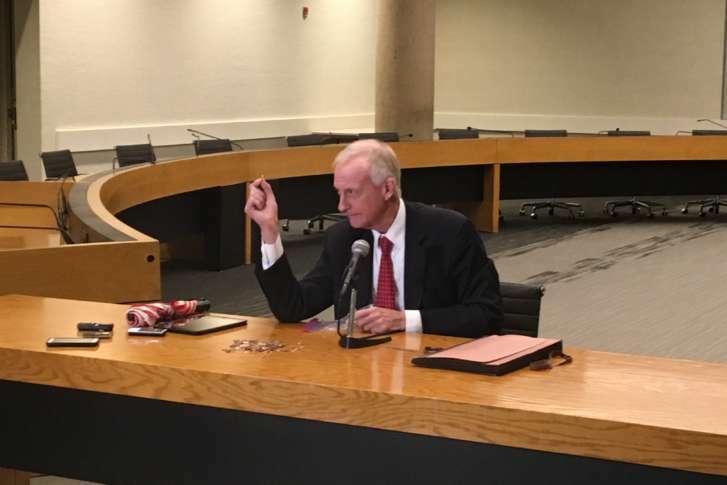 WASHINGTON — Cutting the size of the Metro Board would make little difference, Chairman Jack Evans said Tuesday as he emphasized the need for a significant increase in funding for the system to avoid potentially draconian cuts next summer. “In ‘Game of Thrones,’ they always talk about ‘winter is coming.’ Well, winter is here,” Evans said in an interview. “Metro needs $15 billion of capital money over the next 10 years to fix this system,” Evans said. General Manager Paul Wiedefeld has projected a Metro funding crisis in the fiscal year that starts next July unless additional consistent state, local or federal funding is identified. “The slide we’ve been on, that would get steeper and steeper, and worse for our customers,” Wiedefeld said when he unveiled his fiscal proposals this spring. Maryland Gov. Larry Hogan, Virginia Gov. Terry McAuliffe and D.C. Mayor Muriel Bowser agreed in theory Monday with a recommendation from former U.S. Transportation Secretary Ray LaHood for a temporary smaller Metro Board that could help get the system back on track, theoretically reduce jurisdictional parochialism and potentially persuade lawmakers to provide additional funding. While Evans has endorsed a federal control board, similar to the one that helped right the District’s financial ship, he said the key is that such a board must have significant power that would not be available under LaHood’s proposal. “The elected leadership in the region is completely missing the boat here on the money,” he added. While D.C. Del. Eleanor Holmes Norton on Tuesday called on the entire Metro Board to resign so that the District, Maryland, Virginia and the federal government could appoint one board member each, Evans said he is not going anywhere. He would consider resigning from the board if all 16 current members agreed, if there were a control board with extraordinary powers, and if that board were appointed by some independent source. “To allow the governors and the mayor and the federal government … to appoint the new members of this board puts you right back in the soup again. No matter who you are, you will have an allegiance to who appointed you,” Evans said. In an example of the bombast that has led to harsh criticism for the Metro Board from Hogan and McAuliffe, Evans attacked Maryland and Virginia for not agreeing to the District’s ideas about how to pay for Metro’s long-term needs. “The District is on board with a one-cent sales tax. What it’s going to take to get the two governors to realize how important this system is to the region, I don’t know,” Evans said. Local governments in Virginia who foot the bill for the Metro system and other Virginia leaders are concerned that a flat regionwide sales tax would lead to more of the money being raised at Virginia cash registers than in Maryland or the District. And there have been intense negotiations among regional leaders over a strategy that could be agreed upon and actually be approved by the Maryland and Virginia general assemblies. At the regional summit Monday, Hogan, McAuliffe and Bowser generally agreed that the smaller board and more funding for repairs are necessary, but Bowser said they did not even discuss the details of how that money would be raised. “Here we are in September 2017 and Maryland and Virginia have not done a thing to address this problem,” Evans claimed. Virginia Gov. Terry McAuliffe will discuss Metro and other issues live on WTOP’s Ask the Governor at 10 a.m. Wednesday. Post questions here or call 877-336-1035.